CHICAGO – Marco Elizondo, 20, grew up and still lives in the predominantly Mexican American Little Village neighborhood here on the southwest side. He is a student at a community college and loves to play basketball and hang out with his friends. One day he hopes to become a sports journalist. With school ending and summer fast approaching, he’d like to have a job lined up but, he says, there just aren’t any out there. “I applied everywhere, local supermarkets, Walgreens, CVS Pharmacy, Subway, Panda Express, even the mom and pop stores down the business strip in my neighborhood,” said Elizondo. Elizondo lives with his grandmother. She is struggling to pay the bills and he wants a job to help make ends meet. “Plus she’s not going to be around forever,” he says. “I like playing basketball and hanging out with my friends, but really, I’d rather be working. 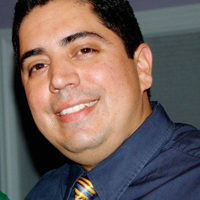 It’s just so hard to find a job,” said Elizondo. According to the latest government figures the unemployment rate is 9.1 percent. The U.S. Labor Department says the official rate of unemployment among those aged 16-19 was more than 24 percent. A recent report by the Center for Labor Market Studies at Northeastern University in Boston, Mass., notes the national youth employment rate in 2011 is projected to fall to an historic low. The report: “The Steep Decline in Teen Summer Employment in the U.S., 2000 – 2010 and the Bleak Outlook for 2011 Summer Teen Job Market,” shows the teen summer employment rate fell by nearly 19 percentage points over the past decade from nearly 46 percent in 2000 to just under 27 percent in 2010, a 40 percent drop. U.S. teen joblessness in 2009 for those 16 to 19 years of age overall was 70 percent joblssness rate, with Black teens leading with 79.4 percent. Hispanic teens were close behind with 73.5 percent. For white teens the rate was 65.7 percent. For the state of Illinois, again Blacks teens led with an 86.7 percent jobless rate, Hispanics with 73.3 percent and whites with 64.5 percent. Metro Chicago and the city of Chicago fared similarly with the Black joblessness rate respectively at 83.6 percent and 89.1 percent, Hispanics at 72.1 and 83.8 percent and whites at 64.3 and 71.5 percent. With the loss of federal stimulus dollars, an additional 18,000 Illinois teens are expected to be jobless this summer. “It’s really a huge crisis,” said Stephanie Brown, national director with the youth and college division of the NAACP. “It’s a national issue plaguing every community and affects all racial backgrounds,” she said. “What we need is a major push for an overall jobs creation program,” said Brown. Jack Wuest is the executive director of the Alternative Schools Network in Chicago. He notes in Chicago alone, nearly 700 children were hit by gunfire last year with 66 deaths. 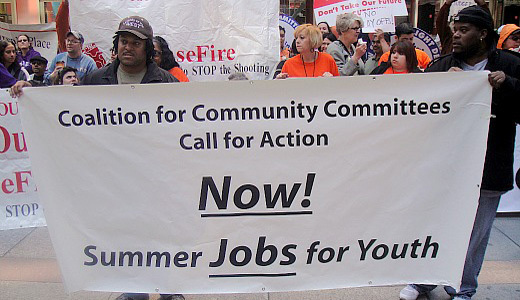 Photo: Community activists rally in downtown Chicago for youth jobs. Pepe Lozano/PW.